Built: 1927, Pullman Car Co. 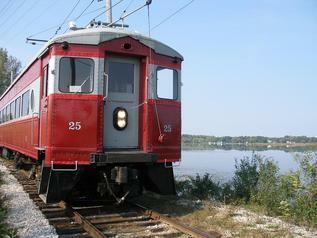 Conversion of car 25 to a dining car began at the East Troy Railroad Museum in 1989 and was completed in the spring of 1992. The newly restored and remodeled car was named "Ravenswood". Dining service proved to be so successful that car 24 was similarly converted in 1994, and named Ravenswood, to increase capacity using a two car train to 100. The East Troy Railroad Museum offers regularly scheduling dining service and charter dining service.